The book “Análise de Fourier para Engenharia Eletrotécnica (in English: Fourier Analysis for Electrotechnical Engineering”) by Francisco Vaz was launched on 2 March. João Claro, INESC TEC’s Member of the Board welcomed the attendees and seized this opportunity to underline that «the book focuses on a vital part of the operation of many systems and it’s part of our daily routine investigation in INESC TEC. For these reasons, I’m delighted to host this book launch». 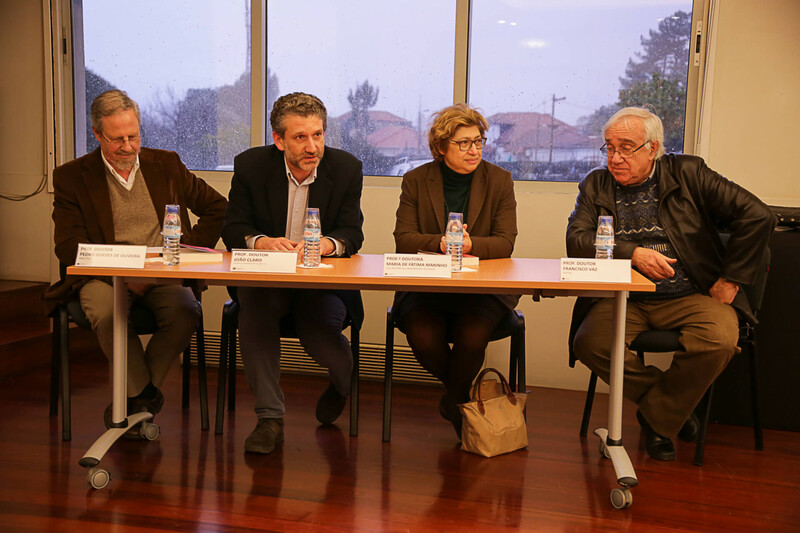 Pedro Guedes de Oliveira, Professor Emeritus of the University of Porto, presented the book. This presentation was also attended by Maria de Fátima Marinho, Vice-Rector for Cooperation and Culture of the University of Porto, on behalf of U.Porto Editions, responsible for editing the book. In the early nineteenth century, Fourier proposed a methodology that enables to represent arbitrary functions in trigonometric functions. The mathematical community had certain reservations about this method. However, the method offered room for new investigations in the nineteenth and twentieth centuries, which made possible the range of instruments that is now available and known as Fourier Analysis. The development of digital computers opens the way to new fields of application, thereby making the Fourier theory essential to clinical imaging or modern techniques of digital television. This book presents the main aspects of Fourier analysis: Fourier Series and Fourier Transform, introduction to theory of distributions, adapting to modern digital world with the discrete transform and the extension of the theory to multidimensional spaces, especially two-dimensional in order to allow the treatment of images. This is a book for post-graduate students that need to enhance knowledge in concept analysis and signal processing. Francisco Vaz has a degree from Faculty of Engineering of the University of Porto (FEUP) and a PhD from the University of Aveiro (UA) in Electrotechnical Engineering. The author began his professional career at the Department of Nuclear Sciences and Engineering (DECN) where he conducted and developed a project in electronic systems to measure radiation. For 5 years, the author worked in industry and then he entered the UA. In 2008, Francisco Vaz retired as a Full Professor. He devoted himself to teaching and researching the signal processing field, specially biological signal. Francisco Vaz took several university management positions, among which vice-rector with scientific research and technology transfer responsibility. The researchers of INESC TEC mentioned in this news piece are associated with INESC TEC and UP-FEUP.